1/26/14: I’ve made a couple edits to let everyone know what I was able to accomplish in the 30 hours (yes 30 freaking hours – almost an entire work week worth at the office) that I spent participating in the Blogathon this weekend! 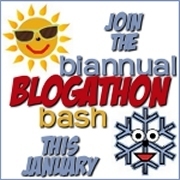 I am participating in the January 2014 Bi-Annual Blogathon Bash! It’s my first blogathon event and I’m pretty stoked. I needed the motivation to take some time and stop “multi-tasking” and just focus on one project, my blog, for a little while. Since I just started my blog in late August 2013, there are definitely a ton of things I can work on. Lots to do and even more to learn! I am hoping to get a lot done this weekend and I think if I accomplish all I hope to, I’ll find that I won’t feel so overwhelmed with list of un-done tasks that is always seems to be looming. The blogathan started this morning and goes until Sunday the 26th. You have to commit to at least 24 hours of blogging tasks; which I think I should be able to do easily over the course of the next three days. I mean I have enough I could do to keep me busy much longer than that! I have a running “to-do” list for my blog so hopefully I can wipe out a ton of the items that never seem to make it all the way to the top! Complete as many of the Blogathon Mini Challenges as I can – I’m pretty proud of myself because I completed all of them which I was sure going in to this I wouldn’t be able to do! Have Fun & Learn some new stuff while I work toward making my blog even more badass! Check! I had a great time and definitely picked up a few awesome tips and met some other awesome bloggers! I will definitely be doing this again in June! Good luck on everyone who is participating and if anyone wants to jump on the Blogathon bandwagon, just click here for details and feel free to join in! The Blogathon is great fun and very informative. Enjoy and good luck.